On 19 – 21 of October, we participated in Des-Cobrir Les Rondes, a 3 days intensive workshop to learn about the history and the state of the ring road of Barcelona – Les Rondes. Using bicycles and public transportation, we discovered in person, the different typologies of the ring road, functionality of the neighborhoods, and the interventions by the municipalities, among others. The ring road was built as a part of a project leading up to the Barcelona Olympics in 1992. Its main purpose was to connect the four Olympic sites in the city. When the ring road was built, it benefited citizens and tourists in many ways. For example, it contributed to spreading out the traffic on Grand Via, Diagonal and Meridiana. 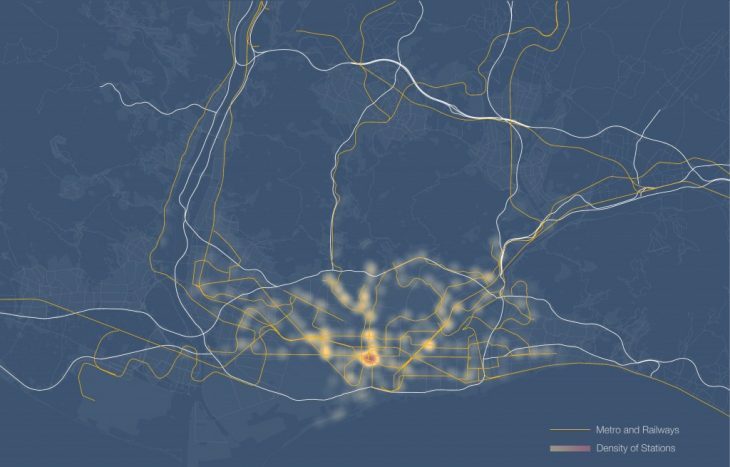 The diagrams below show the traffic of Barcelona before and after the ring road. However, it also created massive infrastructure, which divides neighborhoods and restricts mobility of citizens until today. After 26 years, the ring road has become a major causes of pollution, noise and traffic, reducing the quality of life of citizens. 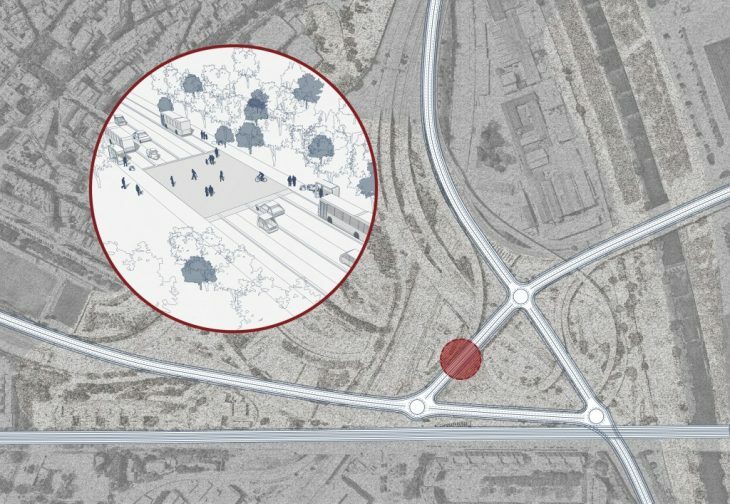 Given this current state, this project aims to reduce the number of vehicles on the ring road and transform the space to improve connectivity of neighborhood and cities at a human scale. First, we looked into the origin and the volume of the vehicles. 44% of the incoming vehicles originate from the neighboring counties, while 38% originate from within Barcelona. 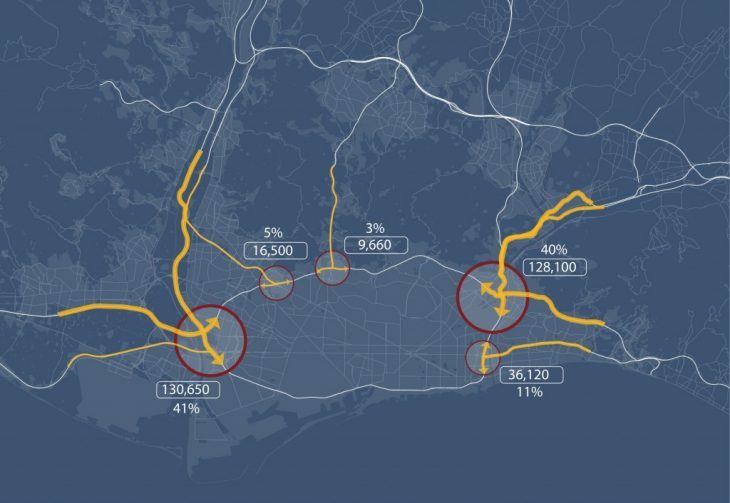 Among the 44% of the vehicles coming from outside of Barcelona, 81% of the vehicles enter the ring road from the 4 highways illustrated in the map below. Second, we compared the highways mentioned above with public transportation accessibility. The image below demonstrates that the highways with high volumes of vehicles are where the public transportation is weak. 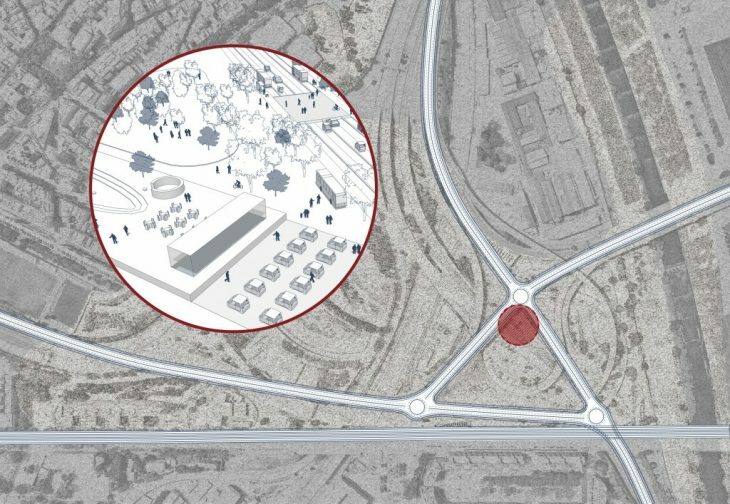 In addition, when we look at the public transportation accessibility within Barcelona, we notice that the horizontal access along the ring road is missing. Given the analysis above, we propose to introduce a new collective transportation system to provide alternative modalities of transportation as illustrated in the image below. 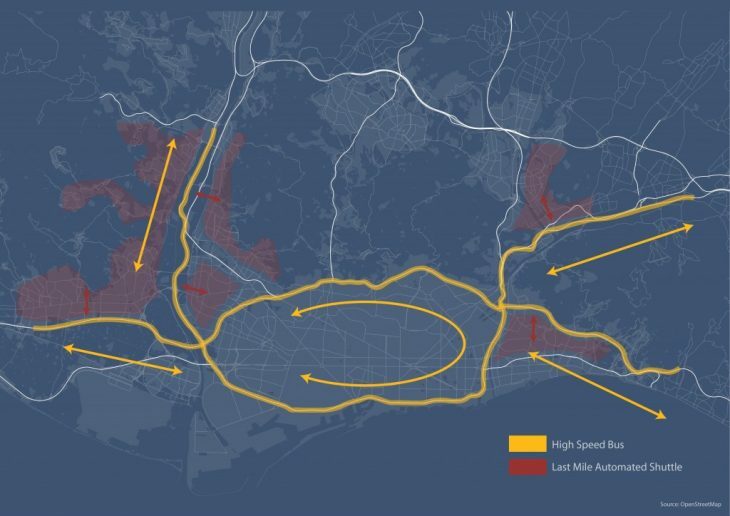 The aim is to improve the connection between the neighboring counties and Barcelona, and within different parts of Barcelona with high speed buses and last mile automated shuttles. In addition to the collective transpiration system, we propose to introduce transit hubs to allow smooth connection between high speed buses and other modalities of transportation. The proposed locations of the transit hubs are indicated below. We chose the transit hub in Trinitat Vella marked in the yellow dotted circle for further design. The below images show the proposed area for the transit hub in Trinitat Vella and the equivalent area in Ciutat Vella. As evident from the comparison, the interchange takes up significant amount of space, dividing the predominately residential neighborhood reducing mobility of residents. 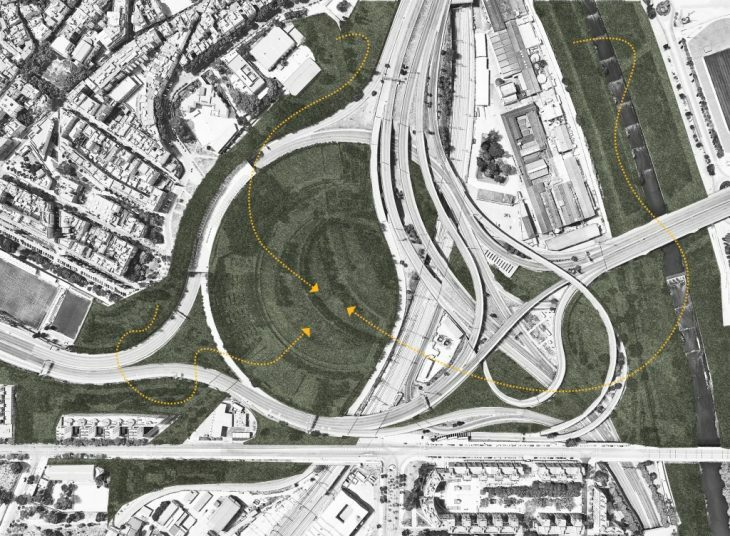 The current interchange is a typical spaghetti junction with complicated and intertwined roads as illustrated in the image below.In addition to being a massive infrastructure, the junction also splits the area and denies accessibility between the regions that are mostly residential in nature.It also makes it difficult to access the park and the underused spaces surrounding the river Besos which have enormous potential to become active public spaces. 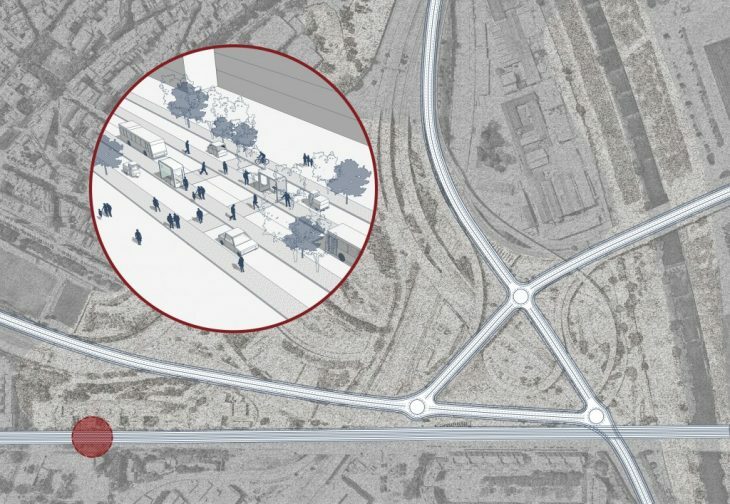 The concept of the design is to link the green spaces that are not currently accessible and turn it into one big public space with priority given to pedestrians. Such a proposal would essentially create a domino effect in successfully transforming the area into a hub of activities. This will be possible due to a number of factors which reduces the volume of vehicles: introduction of a new collective transportation system; increased shared transportation; and changes in work style such as flexible hours and mobile work.Once the infrastructure is removed, the surrounding neighborhoods and cities will be connected with green public spaces and transit hubs. 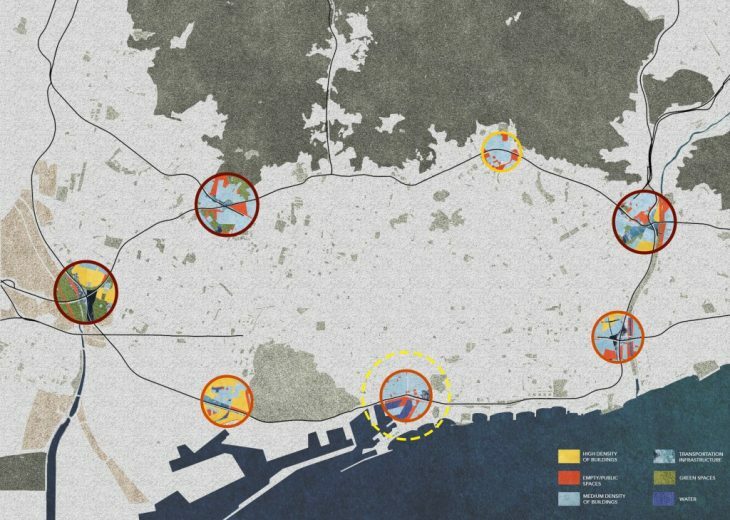 The area illustrated below is where it connects the two high speed buses: one connecting the neighboring counties and Barcelona and the other on the ring road. The high speed buses will occupy the outer most lanes and drive at a low speed giving priorities to pedestrians. 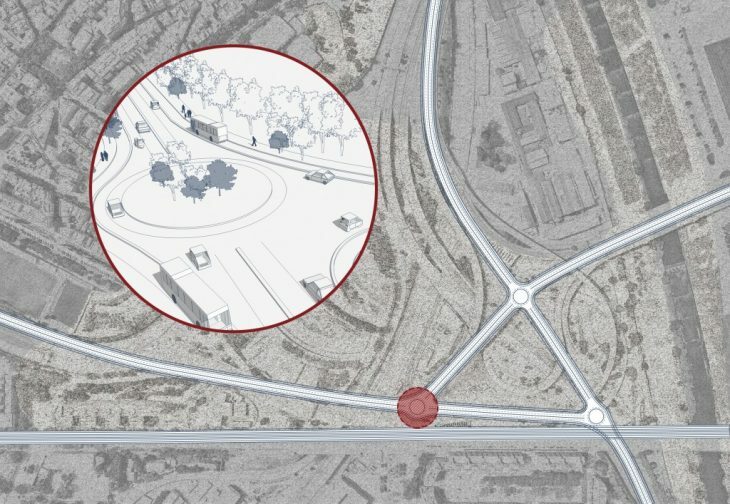 The roundabouts enable vehicles to change directions without having the spaghetti junction. The transit hub will be a space to change transportation modalities including high speed buses, local buses, metros and shared vehicles. The public space in between will be multi-functional and enhance the experience of people in transit and local residents alike. The multi-way boulevard will have local buses running in the center lanes and many points where pedestrians can cross increasing their accessibility. The diagram below illustrates the the built spaces, transportation infrastructure, public spaces and the natural environment of each transit hubs. 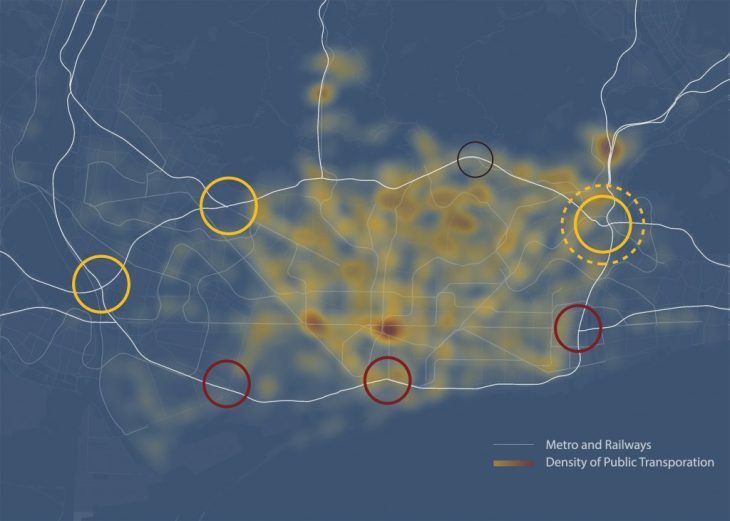 Through this diagram, we can see that each location has unique characteristics and suggests the need to design each transit hubs in accordance with the specific characteristics of the location.